We hope that you'll decide to give a little (or a lot) & help us do all we can to spread the word. Hello Friends Let Us Introduce You To Team Rogue Swan! 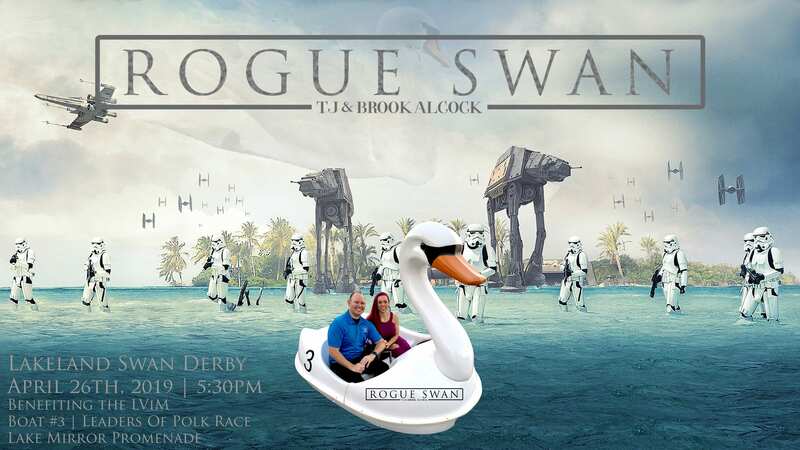 We are Brook and TJ Alcock, owners of TBA Marketing and the captains of Rogue Swan. This event and the swans of Lakeland have meant a lot to us for many many years. In fact, our nickname for each other is “My Swan” and we got married at Lake Morton (7 years ago); as we wanted to start our marriage next to the beautiful swans that share such a special part in our relationship. Years ago, when we heard of the Swan Derby we naturally had to go. When we saw the Swan Boat Races we instantly bucket listed the experience. I mean, who doesn’t want to race a swan boat!?! Over the next few years we had inquired to friends and acquaintances “Just how exactly do you get to be a part of the Swan Derby?” It was always met with either “I’m not sure” or “You have to be selected” but selected by who was still a mystery. Fast forward to the beginning of 2019, TJ came home from a networking event to tell me that we were being considered for the Swan Derby, in The Leaders of Polk Race!!! To say we were excited was an understatement. Two months later we found out that we had been selected!! From the time we attended the first press conference, to the tour of the Lakeland Volunteers In Medicine (LVIM) facility, we were blown away to be chosen to represent LVIM as a Leaders of Polk team. What they are doing, and have been doing in our community over the last 18 years is beyond amazing. This awesome charity provides medical care to the working, uninsured, people of Polk County…. run completely on donations and volunteers! Our love for this charity and event has increased 100x over and racing in the event, while still incredibly exciting, is but a by-product. Our goal is to do everything in our power to bring awareness to the LVIM mission and raise as much money as possible to ensure they can carry out their mission for years to come! We ask that you join us on our journey, whether it be in the form of a donation, or simply sharing our page to others who might not know about LVIM. The more awareness we can create for this great cause, the better. You never know when the person in need will be your friend, family member, or perhaps yourself. This event raises awareness and funds for Lakeland Volunteers in Medicine, a volunteer-run medical clinic that provides free primary health care, mental health services, and dental care to the working uninsured of Polk County. In 2018, LVIM provided $8,167,558 in healthcare to the community. For every dollar invested in LVIM, LVIM provides almost $6 in healthcare services, free of charge to those in need. SGT. CLEAN Pressure Washing LLC.